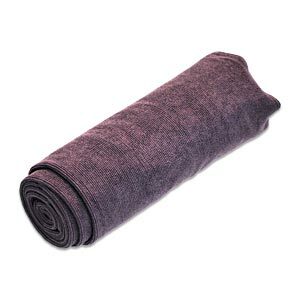 The YOGAaccessories Hand-Size Microfiber Yoga Towel is extremely lightweight, yet durable and super-absorbent. This multi-purpose micro-fiber towel outperforms ordinary cotton towels. For yoga, this towel is the ideal "prop" to keep you and your mat hygienic and slip-free. Quick drying in minutes, even after hot yoga classes like Bikram, the towel quickly absorbs moisture from sweaty palms and feet, enabling greater traction during your routine. Dries faster than cotton, consists of 75% polyester and 25% nylon. This yoga towel should be machine washed separately in cold water. Tumble dry on low.